Penetration resistance of 1100 Newtons and Energy absorbing seat region for flexible underfoot protection. Amblers Safety As707 Trainer: SRA boots - Slip Resistance against slipping on both steel and ceramic surface. Comfortable and durable EVA/Rubber Trainers from Amblers. 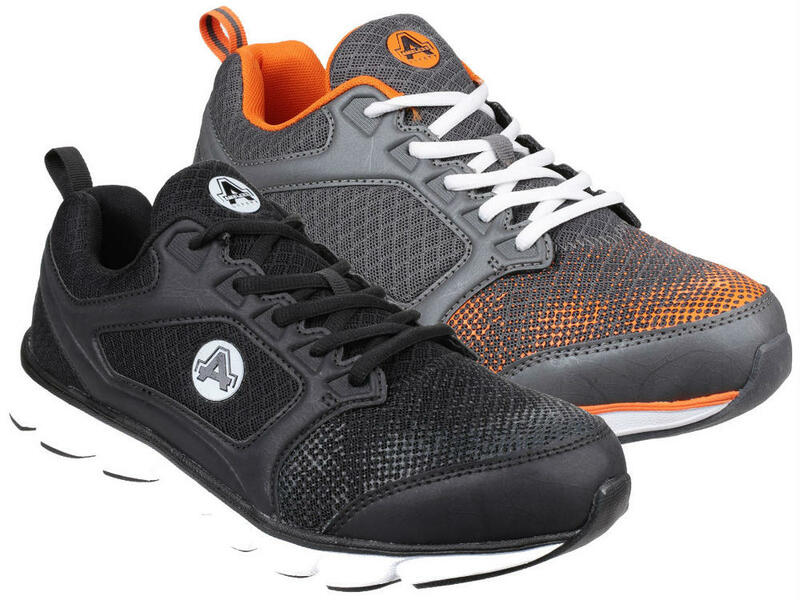 Lightweight sporty safety trainer with athletic breathable moisture wicking mesh upper and flexible traction EVA/Rubber outsole. Breathable moisture wicking mesh lining, Padded collar and tongue, Removable memory foam footbed. Antistatic, Energy absorbent heel, EVA/Rubber outsole. Fuel & oil resistant outsole, Made from leather free material, suitable for vegetarians. Materials: Mesh | PU/Mesh | EVA/Rubber. 200 Joules steel toe cap, Non-metallic anti-penetration midsole.